Will Shortz, born 1952, is a crossword puzzle editor, constructor, tournament director, and game historian par excellence. He currently occupies the same crossword puzzle editor's desk at The New York Times as the one established in 1942 by Margaret Farrar, another crossword puzzle editor par excellence. Shortz, who has been the puzzle editor of The New York Times since 1993, claims to be the only academically accredited person to hold a college degree in the field of enigmatology, which he received from Indiana University in 1974. What's Enigmatology? It's the science of the enigma. What's an enigma? An enigma is a puzzling or inexplicable occurrence or situation. Then, what's a puzzle? A puzzle is a toy, problem, or other contrivance designed to amuse by presenting difficulties to be solved by ingenuity or patient effort. By the way, the term puzzle is synonymous with crossword puzzle, making it a special kind of enigma. Judging from his self-characterization as an enigmatologist, Shortz thinks of himself primarily as a puzzle solver. Perhaps Shortz is right; there is no term better than enigma to describe a crossword puzzle and no better term than enigmatologist to describe the kind of mind that that forges a career in constructing and solving them. The Muses wish Shortz all possible good luck with his definitions. Nevertheless, in the view of The Muse Of Language Arts, he is both an enigmatologist and a language artist. Why? Because crossword puzzles, simple though it may seem at first glance, on deeper reflection are a game that borders on being an art. Learn why The Muse Of Language Arts holds this view; visit The Muse's page called Welcome To The World Of Crossword Puzzles. Look for the section called A Game That Borders On Art: click here. Shortz began his career at Penny Press Magazines. He moved to Games Magazine for 15 years and rose to the position of editor in 1989. He has been the crossword Puzzle editor for The New York Times since 1993, only the fourth in the newspaper's history. In addition to being editor of The New York Times puzzle column, Shortz holds the chair of puzzle master on National Public Radio's (NPR) show called Weekend Edition Sunday, a program he has emceed since its start in 1987. There, he explores puzzles at large, with emphasis on puzzles based on language, including the crossword puzzle. In his chatty and easy manner, every Sunday he discusses puzzles and puzzling with listeners who call in, answers mail, presents an on-air oral puzzle for listeners to solve, and presents the solution to the puzzle he presented the previous week. Visit NPR's web site and see a short profile of Shortz: click here. In the search box at the top of the NPR web page, type the text Shortz. A page containing information about Shortz and his shows will appear. Click any of the linked items on the page on the subject of one of his shows and a page will open containing a summary of what happened on the show. Click the Listen Now link on Shortz' portion of the show and hear a transcription of the on-air radio proceedings. Typically, they last about seven minutes. Shortz founded the American Crossword Puzzle Tournament in 1978, generally considered the premier crossword puzzle tournament in the U.S. He has been its director since that time. He also founded the World Puzzle Championship in 1992 and is a director of the U.S. Puzzle Team. Explore the World Puzzle Federation at its web site: click here. Explore the U.S. Puzzle Team at the team's web site: click here. Shortz is currently the historian of the National Puzzlers' League. Explore the National Puzzler's League at its web site: click here. Shortz is the author or editor of more than 100 books and has a collection of over 20,000 puzzle books and magazines dating back to 1545, reportedly the world's largest private library on the subject. Explore the American Crossword Puzzle Tournament founded and directed by Shortz in 1978. Visit Electricka's page called the American Crossword Puzzle tournament: click here. Explore the American Crossword Puzzle Tournament at the ACPT web site: click here. See Shortz' bio at the American Crossword Puzzle Tournament web site: click here. Wordplay is the title of a movie about crossword puzzles which documents the 2005 competition of the American Crossword Puzzle Tournament. In his capacity as tournament director, naturally Shortz figures prominently in the movie. Explore Shortz and the movie at The Muse Of Film's review of Wordplay: click here. Edith Reynolds has written a 2003 editorial about Shortz which is posted at the Bookologist web site. Read this article: click here. 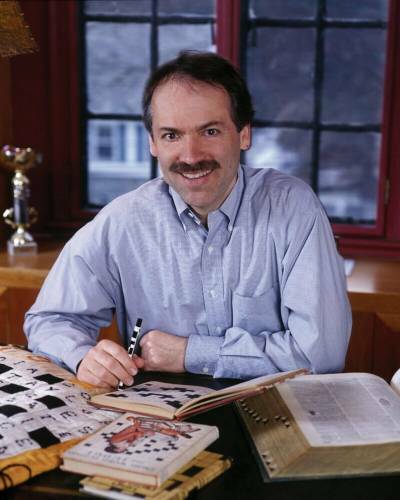 Edith Reynolds reports on her 2003 interview of Shortz, in which the puzzle master offers his views on crossword puzzles and on what makes a good collectible crossword puzzle book. See her account of this interview: click here. The online magazine Wired has posted Jonah Freedman's account of his 2003 interview of Shortz, which commemorates the latter's 10th anniversary as puzzle editor of the New York Times. In the interview, the puzzle master talks about himself and expounds on a variety of subjects ranging from the recent and past history of crosswords, to the type of person who solves puzzles and his reasons for playing, to the impact of computers and the Internet: click here. Perhaps the most prominent and interesting of all crossword puzzle tournaments in the U.S. is the American Crossword Puzzle Tournament, founded in 1978. It has met every year since then, plenty if time to develop into a subculture of the world of crossword puzzles in its own right. Shortz runs the tournament and has been a commanding figure in its organization. Explore crossword puzzle competition at Electricka's feature on arts-games tournaments; visit page called the American Crossword Puzzle Tournament: click here. Wordplay is the title of a movie about crossword puzzles which documents the 2005 competition of the American Crossword Puzzle Tournament. It is one of only a few movies about crosswords and the only documentary known to The Muse Of Language Arts that offers a vivid peek into the almost mystically intense subculture that is the world of the crossword puzzle tournament. In his capacity of director of the the American Crossword Puzzle Tournament, Shortz runs the tournament and has a leading role in the movie. Explore the world of crossword puzzle tournaments as documented in a film about the American Crossword Puzzle Tournament (see above). See a review of the movie Wordplay at the Muse Of Film's page called Movie Reviews - Wordplay: click here. As noted above, Will Shortz currently occupies the same crossword puzzle editor's desk at the New York Times as the one established in 1942 by Margaret Farrar. Who was Margaret Farrar? She was a pioneer and innovator in the field of crossword puzzles and the founder and first editor of the New York Times crossword puzzle column. For a cross-worder, sitting behind Farrar's desk is an honor comparable in some respects to that enjoyed by physicist Stephen Hawking, who occupies the same Lucasian Professor of Mathematics chair at the University of Cambridge as the one once occupied by Sir Isaac Newton. The story of her life and times is the story of the first fifty years of the crossword puzzle. If you're interested crossword puzzles, you shouldn't miss it. Compare two crossword puzzle giants. Explore the life and accomplishments of Margaret Farrar at Electricka's page called, A Life in the Arts—The Life of Margaret Petherbridge Farrar: click here. If you're interested in crossword puzzles, you may want to explore The Muse Of Language Arts' feature called The World Of Crossword Puzzles. Explore the World Of Crossword Puzzles at The Muse Of Language Arts page called Welcome To The World Of Crossword Puzzles: click here. Gridlock: Crossword Puzzles and the Mad Geniuses Who Create Them, Matt Gaffney. Crossworld: One Man's Journey into America's Crossword Obsession, Marc Romano. Cruciverbalism: A Crossword Fanatic's Guide to Life in the Grid, written by Stanley Newman, a prominent constructor with inside connections, with writing assistance from Mark Lasswell. Wordplay is the title of the mise en scène depiction which documents the 2005 competition of the American Crossword Puzzle Tournament. It is one of only a few movies about crosswords ever filmed and the only documentary known to the Muse Of Film that offers a vivid, behind the scenes peek into the almost mystically intense subculture that is the world of the crossword puzzle tournament. Some who have seen the move in theaters have reported live interaction going on while the movie is underway, with members of the audience calling out answers to puzzle clues before they're worked out on the screen and the like. If this kind of falderal and the big screen turn you on, by all means see the movie in a theater—if you can find it on the circuit. Otherwise, the DVD is a better way to spend your time. It's packed with entertaining and informative extras such as a commentary, interviews with winners and filmmakers, and other bonus goodies. There's nothing like a companion book to illuminate a movie and vice versa. If The Muse's review of the movie Wordplay interests you or if you see the movie Wordplay itself and get turned on by it, you may want to try exploring the movie's companion book called, Wordplay: The Official Companion Book by Will Shortz. This book is the companion to the movie. With it you can think inside the box! Solve puzzles from the hit movie, learn to construct your own crosswords, and much more.